China has asserted it wants to partner with South Korea, Malaysia and Laos to safeguard peace and stability in Asia. Top Chinese legislator Wu Bangguo met parliament leaders from the Republic of Korea(South Korea), Malaysia and Laos respectively on Monday and Tuesday in Russia’s Far Eastern city of Vladivostok to discuss bilateral ties and ways for further cooperation. This comes in the backdrop of the US administration’s announcement of a “pivot to Asia” strategy in October 2011, which drew widespread suspicion and criticism in China. America’s military pivot towards Asia, moving away from middle-east engagements and towards ensuring China does not dominate the Asian region has been a sore issue in Sino-US ties. 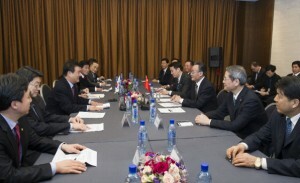 Meanwhile at Vladivostok, Bangguo told Kang Chang-hee, speaker of the National Assembly of the Republic of Korea that China’s new leadership attaches great importance to China-ROK relations and is looking to step up communication and coordination with the ROK on international and regional issues. The South Korean leader lauded China’s constructive role in international and regional affairs. The two met on the sidelines of the 21st annual meeting of the Asia-Pacific Parliamentary Forum in Vladivostok. China will strive to further advance bilateral ties and make joint efforts with the ROK to safeguard peace and stability in Northeast Asia, Bangguo said. Bangguo also met Abu Zahar, president of Malaysia’s Senate. In his meeting, Bangguo said the relations between China and the Association of Southeast Asian Nations (ASEAN) play an important role in maintaining stability and promoting development in Asia. According to research by the Financial Times, China provides more loans to developing countries than the World Bank. China will continue to support the integration process of ASEAN, Bangguo said. The region is home to rich reserves of oil, gas, minerals, hydropower, rice, palm oil, coffee and timber resources. China-ASEAN strategic partnership will make greater contributions to regional peace, stability and prosperity, Bangguo said.